This image has become iconic of the ancient Maya. It’s been attributed to, or in the style of, Jean Charlot, a French/American painter, illustrator and muralist who spent many years working and studying in Mexico - and depicted many human load carriers in different contexts. It clearly shows calendar elements, but what exactly, who is in the middle and what is he carrying? The circle of glyphs form the 19 ‘months’ of the haab’ or solar calendar of the Maya. The 18 primary months all consist of 20 days, with a short final period of just 5 (unlucky) days - making 365 in total. The last five days in the solar year - called uayeb or wayeb by the Maya and nemontemi by the Aztecs - were considered dangerous days (safer to stay at home!) as they didn’t fit in to the normal ‘count’ of days. Unusually the illustrator here has drawn the 18 month glyphs in a clockwise sequence, starting with Pop, the first month. We’ve indicated first and last ‘months’ in pic 1. In the centre, the ‘load’ being carried is another calendar glyph, this time one of the 20 day signs - in fact, the last one, ajaw, meaning ‘lord’ or ‘ruler’. It’s hard to recognise but when viewed on its side (pic 2) it becomes clearer in the main illustration. 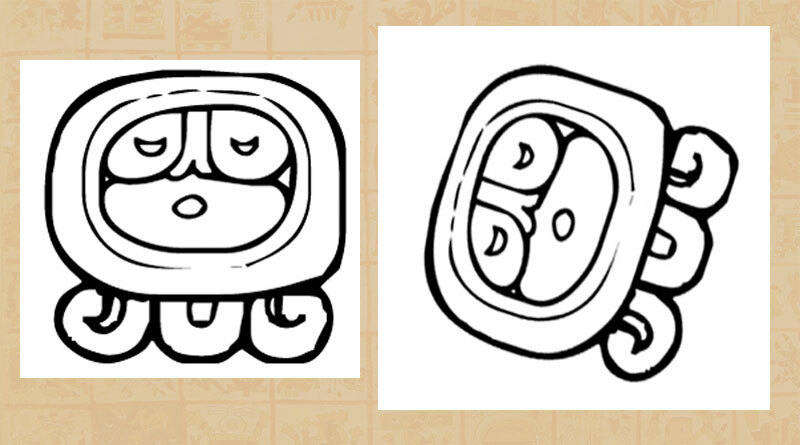 Since many Maya monuments recorded the stories and achievements of rulers and their dynasties, ajaw is a common glyph in Classic Maya art generally. In this context the ‘day’ being carried implies the start of the whole calendar year so the load carrier is actually the ‘year bearer’. This is best explained in the words of the pioneering English Mayanist J. Eric S. Thompson, who wrote, back in 1960, ‘The Maya conceived of the divisions of time as burdens which were carried through all eternity by relays of bearers... [not] the journey of one bearer and his load, but of many bearers, each with his own division of time on his back.’ We can see these shown clearly in the series of calendar glyphs from Stela D at the Maya site of Copán in Honduras (see pic 3, left). 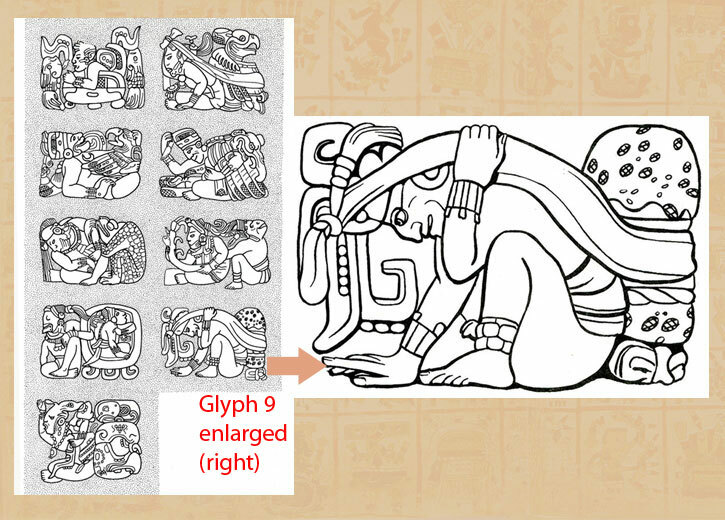 These glyphs are unusual as they use ‘full-figure’ pictures: the Maya showed both numbers and units of time in two ways, either as (abstract) number signs (such as bars and dots) or, as here, as ‘portraits’. They’re not people at all but deities, actually PAIRS of deities, and each carries on his back a calendar god sign - not of a day, month or year, but of a large group of years, part of a ‘Long Count’ (a period of thousands of years). So each of the figures at Copán is in fact a PAIRING of a number god with a time-period patron god. Complicated! 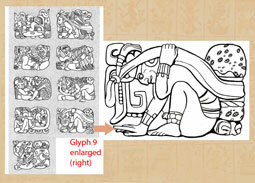 The illustrator of the ‘burden of time’ picture (top) appears to have based his/her image on glyph 9 from Stela D at Copán - a figure depicting, according to John S. Henderson, the sun god, carrying a jaguar-skin bundle - perhaps a representation of the lord of the night (jaguars were/are associated with night-time). In a nice coincidence, one of Jean Charlot’s classic paintings is ‘The Leopard Hunter’ (with the creature being carried by a tumpline on the hunter’s back - follow link below to view). In what Thompson calls the ‘never-ceasing journey of time’, each bearer of time plays his part in a cosmic relay, preparing to rest on completion of his individual stage, and to pass on the burden to the next carrier. In the sequence of glyphs at Copán we see how ‘the resting gods hold the periods or support them in their laps. The god of number 9 [ours! ], the bearer of the baktun [largest unit in the Long Count calendar], still has his load on his back, held there by the tumpline.... His hand is raised as though to slip off the load’. • Pic 4 (centre): photo by Ian Mursell/Mexicolore. • The quotes from Thompson come from Maya Political Science: Time, Astronomy and the Cosmos by Prudence M. Rice, University of Texas Press, 2004. Q. How many times could each god rest on his time-bearing journey? Based on I seen, this “Maya Calendar” looks like a modern image and the guy in the middle looks more like Jean Charlot’s 1929 painting called Leopard Hunter.